Here we are in the Lower Mainland of BC, on the river that has been referred to as “the world’s greatest salmon river,” a.k.a. the Fraser – or to use one of its more venerable names, the Stó:lō. Salmon and humans have coexisted here for millennia, for hundreds and hundreds of human generations prior to the arrival of European settlers. The salmon migrate seasonally from the streams to the sea, and they have always returned, in fantastic numbers, to spawn. One species in particular, Chinook, are also essential food for another of BC’s iconic species, the southern resident killer whales (orcas). At least until relatively recently. Now the salmon aren’t returning. There have been official efforts to understand why – the Cohen Commission, ongoing investigations into fish farms – and some attempts at managing the problem: fisheries have been reduced, and closed. There appears to be no shortage of factors making life difficult for Fraser salmon, but the state of the Fraser River is certainly among them. The lower Fraser River has been diked and dredged, and dosed with pollutants from shoreline activities and upland run-off. Vegetation providing shade and nutrients along the banks has been razed. The streams and tributaries that flow into this part of the Fraser have been similarly abused, and sometimes confined to underground channels in urban areas. Over the past 100 years or so the floodplain of the Fraser was diked and filled so that the flat, fertile lands could be used for agriculture and then major transportation infrastructure (roads, railways and Vancouver airport), and commercial, industrial and residential development. Flood gates in the dikes allow water from streams flowing into the Fraser to escape, but close if the water in the Fraser rises too high. A recent study from Simon Fraser University investigated the operation of these floodgates. The gates are also supposed to allow passage of salmon migrating upstream and downstream in the tributaries. The researchers found that in some cases, the floodgates were closed during the very time when juvenile salmon were trying to migrate. Have you ever been locked out of your house, or maybe your car? It’s extremely frustrating, but imagine how dire it would be if your life (and the lives of your future children) depended on it. Operation of the floodgates also affects water quality, and the installation and design of floodgates, even when open, can hinder passage for fish. “orphan dikes” and other flood management infrastructure, as described in a report from the Environmental Law Centre at the University of Victoria prepared for Watershed Watch Salmon Society. The lack of oversight might be surprising, given that approximately 600 kilometres of dikes in and around the lower Fraser effectively “harden” shorelines and the river’s edge. In the process, they make it possible to drain and use the natural, flat floodplain of the river for farming, for roads and railways, the Vancouver airport, and for commercial, industrial and residential development. Maintaining urban development is obviously important, but so is maintaining the health of the salmon-rich Fraser. Our current legal system may not be safeguarding both these priorities. The Fraser River dikes have historically been managed by a hodgepodge of local diking authorities, although the province is now encouraging local governments to manage all the dikes within their respective boundaries. The province recently assessed the flood management capacity of the dikes (and found it lacking), but no consideration has been given to the broad impact of the dikes on fish and Fraser River ecosystems. In general, the importance of riparian vegetation for fish has been acknowledged by BC legislators. Municipalities in the Lower Mainland are governed by the Riparian Areas Protection Act, which requires vegetated buffer strips alongside streams. But the Act doesn’t apply to the dikes themselves. Guidance from the provincial and federal agencies limits the vegetation allowed on dikes, despite the fact that it could provide riparian habitat benefits. While we don’t have a comprehensive analysis of the environmental impacts of diking on the Fraser – loss of connectivity to tributaries, loss of riparian vegetation, loss of natural features along its banks, for example – we do know that approximately 70% of the wetlands in the Fraser estuary have been lost to diking, draining and filling. New research has confirmed that hardening the shoreline in coastal and estuarine areas triggers negative impacts on fish and other species across ecosystems. In the 1980s, relying on the Fisheries Act, federal regulators put in place a “no-net loss” policy that applied, among other places, to the Fraser River and its biologically-rich estuary. The idea was to “have your cake and it too” – riparian and marsh habitat could be destroyed to make way for various undertakings, but it would all come out right in the end with compensation in the form of restored or re-created habitat in other locations. In 2016, the Community Mapping Network (CMN) decided to take a look at these compensation projects, to see if they were meeting their objectives. The results were startlingly bad: in marsh areas, two-thirds of the projects reviewed failed to acceptably compensate for lost habitat. The study concluded that the “no net loss” of habitat was not being achieved in the Fraser estuary. And there’s no reason to believe that the current “offsetting” policy under the weakened Fisheries Act has been producing better results, given the findings and recommendations of the companion CMN study regarding restoration practices. 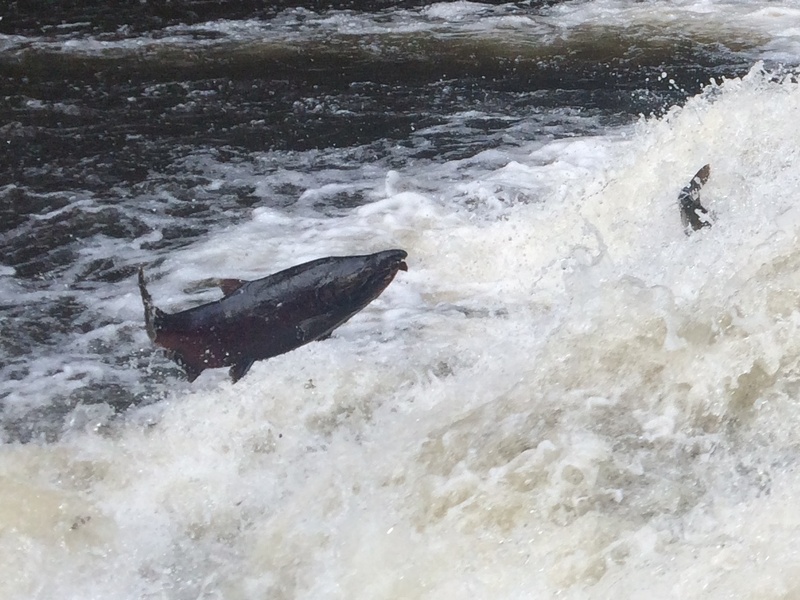 Declining salmon affect other species. Scientists are telling us that southern resident killer whales – whose numbers have become dangerously low – are suffering, in part, from a decline in Chinook salmon. Restoring Chinook abundance to historic levels will be difficult, but if we want the orcas in this region to survive, we need to act. How are the federal and provincial governments responding? These studies are public knowledge and have been widely reported. Yet despite having this information, the federal and provincial governments have invested more than a million dollars in Phase 1 of the Lower Mainland flood management strategy, with scant attention paid to environmental protection or management of the irreplaceable Fraser estuary. West Coast is a member of the Environmental Advisory Committee for Phase 2 of the flood strategy development, and we are advocating for an integrated approach that includes environmental protection and green infrastructure. We will be asking the federal and provincial agencies to fulfill their responsibilities towards salmon, orcas, and other species. Along with further flood protection measures, a number of proposed projects for the Lower Fraser region have serious environmental implications. Two of the larger projects are the Roberts Bank Terminal 2 expansion (currently undergoing federal environmental assessment), and the construction of a coal terminal at the Fraser Surrey Docks (challenged in Federal Court by concerned citizens, decision pending). Thankfully another project is on hold; the replacement of the Massey Tunnel with a bridge has currently been paused by the provincial government. In light of our grave concerns about salmon, orcas, and other species that rely on the Lower Fraser River, shouldn’t we be stepping back and giving some fundamental consideration to how we are caring for the Fraser? As retired DFO biologist (but tireless environmental advocate) Otto Langer suggests, perhaps it is time to press pause on all of these major project proposals, and issue a moratorium while we get our house in order. On the good news front, we know that Coast Salish peoples have lived sustainably and successfully in this region for many thousands of years. In this era of reconciliation, it is time not only to fully acknowledge and honour Indigenous rights and laws, but to listen, learn and rethink non-Indigenous laws and approaches to managing our activities in the Fraser. One example is the recent Burrard Inlet Science Symposium, hosted by Tsleil-Waututh Nation, offering insight and inspiration for new collaborative approaches to improve the health of the inlet. Another is the fish-friendly floodgate that the Musqueam installed on Musqueam Creek (which feeds into the Fraser) as part of their work to restore the creek and steward the recovery of its salmon populations. 1. Federal and provincial governments: Support the development of co-governance arrangements with First Nations for the Lower Fraser. This should provide overarching management direction and binding regulatory objectives that recognize and implement Indigenous rights and laws flowing with the Fraser, in accordance with the United Nations Declaration on the Rights of Indigenous Peoples (UNDRIP). 2. Federal government: Reinstate the habitat provisions of the Fisheries Act, develop strong regulations around rehabilitation requirements and methods, require regional assessment of cumulative effects, and provide funding for enforcement and ongoing monitoring. Participate actively in the development of the Lower Mainland Flood Management Strategy. 3. Provincial government: Strike a high level inter-agency committee with representation from all ministries, with a mandate to identify all provincial laws and regulations that affect environmental values in the lower Fraser. Identify regulatory mechanisms that would support integrated environmental management at a strategic and operational level. Amend existing regulations to enable environmentally-friendly alternatives to hard flood management infrastructure, and require that existing flood management infrastructure meet environmental standards. Complexity is no excuse for failing to protect the critical habitat in the Lower Fraser. Every stressor that we can manage must be reduced. With the development the Lower Mainland Flood Management Strategy underway, local governments will be making decisions about how to invest major funding to manage flood risks and adapt to climate change. This means we have a window of opportunity to reduce the harmful effects of existing diking infrastructure on fish, and to look at softer, greener alternatives that can provide both community and ecosystem resilience, particularly in coastal and estuarine areas. Other jurisdictions are already making it mandatory to consider green alternatives to conventional flood management, including hybrid approaches that combine gray and green infrastructure. At the local level, in 2018, Metro Vancouver’s Integrated Liquid Waste and Resource Management Plan is up for its eight-year review and renewal, and there is an opportunity to improve watershed management and wastewater treatment. Further, the federal government is currently reviewing key federal legislation affecting the Fraser (environmental assessment, fisheries, and navigable waters). And the new BC Minister of Environment and Climate Change Strategy has a mandate to revitalize provincial environmental assessment. Both the federal and provincial governments have committed to implementing UNDRIP, and some First Nations have specifically asked them to explore co-management and collaborative governance arrangements on the Lower Fraser. The opportunities are here, and it’s time to do what we can to make the salmon feel welcome, again, in the Lower Fraser. We think the orcas would agree. Top photo: Chinook salmon (Sam Beebe).